We have had a strong start to August at One Marine; the weather has been kind and enabled us to enjoy being out on the water. We have had number of completions and many enquiries from both buyers and sellers. Snowgoose, The 2004 Nimbus 380 Commander is now priced at £119,750 down from £128,000; this generous reduction has encouraged viewings and interest. 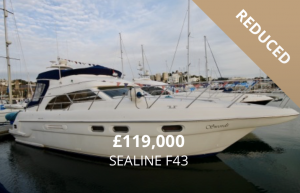 This really is a great value boat from such a renowned manufacturer. There is plenty of space onboard, perfect to wine and dine! Please contact us if you would like to arrange a viewing. 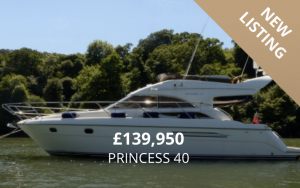 We are also delighted to announce the listing of a Princess 40 priced at just £139,950. This boat is immaculate, only 700 hours use and has benefitted from many updates including new carpets, canvas, navigation electronics and synthetic teak to the platform, cockpit, flybridge steps and side decks. This is a perfect opportunity to buy a highly sought-after motoryacht which will suit your lifestyle. We are open seven days a week, so we can arrange viewings at a convenient time to suit you. Please contact our office on 01803 29 22 39, alternatively email us on info@onebrokerage.com. We are always looking for more brokerage boats so please do contact us if you would like us to carry out a valuation for you. We are a forward thinking company and our dedicated team can offer excellent customer service and competitive rates. The Southampton Boat Show is next month, we are preparing and planning for this and we hope we will see you there!